The US has given details of how guards mishandled copies of the Koran at its Guantanamo Bay prison, including a case of one copy being deliberately kicked. It was part of an inquiry sparked by a magazine report, later retracted, that a Koran was flushed down a toilet. The US listed five incidents of mishandling at the Cuban facility, including the splashing of urine and water on copies of the Koran. The report said most of the cases were accidental or unintentional. It also said that there were a number of cases where detainees had desecrated the Koran by ripping pages, urinating on it and trying to flush it down a toilet. Brig Gen Jay Hood, commander at Guantanamo, said in his report: "We defined mishandling as touching, holding or the treatment of a Koran in a manner inconsistent with policy or procedure. He confirmed that five of these alleged mishandling incidents by US guards did take place. In one instance, a guard was said to have urinated near an air vent. The wind allegedly blew his urine through the vent, soiling one detainee and his Koran. According to the report, the guard was reprimanded and sanctioned, and the inmate was given a new uniform and Koran. Other Korans became wet after night-shift guards had thrown balloons filled with water into a cell block, the report found. In a third case, an interrogator reportedly apologised to a detainee after stepping on his Koran. In a fourth incident, a soldier deliberately kicked Islam's holy book. 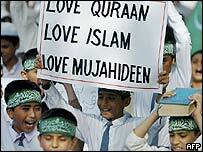 Finally, a prisoner found a "two-word obscenity" in English written in his copy of the Koran. Gen Hood concluded that the words might have been written by a guard or by the detainee himself. 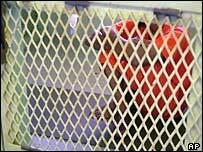 He said: "When one considers the many thousands of times detainees have been moved and cells have been searched since detention operations first began here in January 2002, I think one can only conclude that respect for detainee religious beliefs was embedded in the culture of [Guantanamo Bay's task force]." The earlier report in Newsweek magazine of the Koran being flushed down a toilet by guards had sparked protests across the Muslim world. In Afghanistan, riots resulted in the deaths of at least 15 people. Thousands rallied in Egypt, Pakistan, Jordan, Lebanon and Malaysia, demanding apologies from the US and punishment for those involved. The inmate who made the original allegation about the Koran being flushed down the toilet had retracted it, said Gen Hood.